D.J. Tierney, Managing Director, Client Portfolio Strategist, discusses trends in the ETF market, how to navigate the growing ETF landscape, and provides three key factors for evaluating strategic beta ETFs. What I like to point out to advisors is looking at the ETF market can be pretty intimidating. There’s over 2,000 different funds to choose from. The comparison I like to make is you wouldn’t want to go to the grocery store to do your weekly shopping while you’re hungry without a shopping list. So likewise when you start looking at the ETF market start with your investor, what are their objectives? What does their existing portfolio look like? Starting there with the investors’ objectives in mind, that’ll lead you to the asset class and maybe the investment style that’s most appropriate for them. Once you’ve got into an asset class then you can focus on how to evaluate them. What’s the cost? What’s the liquidity? And what’s the actually underlying exposures of the index? So if you start there you can use the market and all its choices to your benefits. And equity, U.S. equity market cap products now you can actually buy ETFs with expense ratios as low as 3 basis points, so look for low cost. Look for liquidity of the fund. And then ask yourself, does the underlying index complement the investor’s existing portfolio. If they have a bunch of active advisor funds in there, then low cost market cap could be the perfect complement, if they already have low cost market cap, perhaps it’s time to consider strategic beta. So again, if you start with the investor’s objectives in mind, use the multitude of choices in the market to service your clients, you’ll have a good outcome. According to Morningstar there’s over 650 strategic beta ETFs now in the market, over 220 multifactor ETFs. So product proliferation is big, there’s a lot coming on. So what we would advise advisors for their investor’s behalf is to look to funds with an established market record, you cannot back test the data, but actual time in the market. And then ask the question, “How does this product fit my client’s existing portfolio?” At Schwab we think a differentiated strategic beta can be a complement to index market cap, can be a complement to active and serve a real purpose for offsetting returns which again can reduce risk and enhance returns over the long term. So key is with strategic beta is liquidity. Is the fund big enough and stable enough that it’s going to make it in the long term? Again, cost, a lot of these new products are coming online with big OER expenses. So look for relatively low cost. Big expenses can be a big hurdle for the strategy to overcome with performance over the long haul, so, to tie it up; look for low cost, look for real time in the market and a committed provider that’s going to be with you for the long haul. ETFs as an investment vehicle are doing quite well, 2016 was a record inflow year, 2017 we’ve already surpassed it in inflows. So two noteworthy points about inflows that I would make, one, a majority of the flows into ETFs are not going into U.S. equities. The second point is low cost is winning. So talk about that, 2017, again, record inflows. The story is the biggest asset class to gather assets in ETFs this year are international equities. It’s often underreported but over 38% of inflows this year have gone outside the U.S. equities. Secondly, fixed income is really growing in ETF as well. Year to date, 30% of the flows have gone into fixed income. You also have commodity ETFs. So what’s left after that is going into domestic equities but it turns out that it’s less than a third of inflows 2017 are going into U.S. equities. The next point, low cost is winning. So of the 2,050 some odd ETFs out there, only 120 have operating expense ratios of 10 basis points or less. So that’s around 6% of the ETFs. Those ETFs have 40% of the assets in the industry. And year to date they have captured 50% of the inflows, so low cost is winning, cost matters to investors. 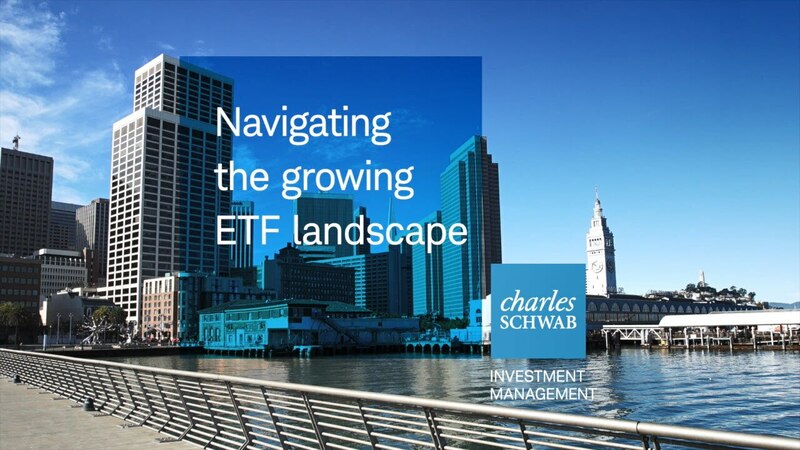 At Charles Schwab, we’re one of the scale sized players that is committed to using our scale and expertise to being committed to low cost investing and low cost ETFs. Investment returns and principal value will fluctuate and are subject to market volatility, so that an investor’s shares, when redeemed or sold, may be worth more or less than their original cost. Unlike mutual funds, shares of ETFs are not individually redeemable directly with the ETF. Shares of ETFs are bought and sold at market price, which may be higher or lower than the net asset value (NAV). The opinions expressed are not intended to serve as investment advice, a recommendation, offer, or solicitation to buy or sell any securities, or recommendation regarding specific investment or trading strategies. Information and data provided have been obtained from sources deemed reliable, but are not guaranteed. Charles Schwab Investment Management makes no representation about the accuracy of the information contained herein, or its appropriateness for any given situation. Some of the statements in this video may be forward looking and contain certain risks and uncertainties. The views expressed are those of D.J. Tierney and are subject to change without notice based on economic, market, geopolitical, and other conditions. Please note that this content was created as of September 2017 and reflects the speakers' views as of that date. It will be kept solely for historical purposes, and the speakers' opinions may change. The opinions expressed are not intended to serve as investment advice (either under the Investment Advisers Act of 1940, or the Department of Labor’s Fiduciary Advice Rule), a recommendation, offer, or solicitation to buy or sell any securities, or recommendation regarding specific investment strategies. Information and data provided have been obtained from sources deemed reliable, but are not guaranteed. Charles Schwab Investment Management makes no representation about the accuracy of the information contained herein, or its appropriateness for any given situation. Some of the statements in this document may be forward looking and contain certain risks and uncertainties. Please note that this content was created as of the specific date indicated and reflects the speaker's views as of that date. It will be kept solely for historical purposes, and the speaker’s opinions may change.